You are here: Home / What is Qigong? Qigong is a way of directly experiencing and opening to the subtle energy known as Qi in oriental medicine. It connects us more deeply to the natural flow of energy around us and to the source of our aliveness. 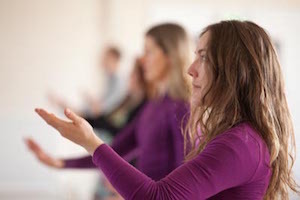 Benefits of Qigong may include increased vitality and mobility, enhanced clarity of perception, the development of inner stillness, the clearing of chronic illness and, most of all, a deeper enjoyment of being alive. Qigong’s origins lie in the preliterate society of China some 5000 years ago. It is said to be the root of all Chinese medicine as well as the basic method through which the subtle energy body was first observed and mapped, leading to the the system of meridians and points used by acupuncturists and bodyworkers. The earliest recorded Qigong is the practice of imitating the sound and movement of animals, such as the deer or bear, to develop the special powers perfected in each animal. Qigong differs from most western trainings in its emphasis on relaxation and not-trying as key methods. Yet within the field of Qigong there are many and varied styles ranging from the sitting and meditative through to the exuberant and martial. It is the subject of extensive research in China and is fast gaining ground in the west both as a method of health maintenance and as a path of personal spiritual growth. 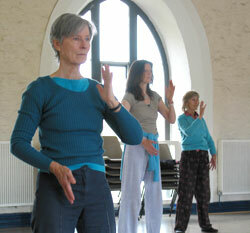 Qigong Southwest promotes the Dao Hua Qigong style. Hua Gong, as it is more commonly known, has been developed by Zhixing Wang and his wife Zhendi Wang who both received teachings from Master Zhang Hong Bao and later Master Shi Song in China. Initiated and inspired, they have devoted themselves to the practice ever since. Hua Gong is a result of the visions and experiences of their Qigong practice, and the integration of Chinese Qigong into Western society. Hua means transformation, purification, integration, and liberation. Hua is a rather poetic term that contains a sense of beauty in itself. A butterfly coming out of a cocoon is an illustration of the Hua. The following images are also good illustrations of the Hua concept: bees produce honey from hundreds of flowers; mountain snow melts in early spring; morning mist dissipates in sunlight; bright moon merges through clouds; an eagle flies freely in the air. Hua Gong focuses on health and healing, artistic creativity, and the spiritual aspects of Qigong practice. It is simple to learn, yet rich enough to become a lifelong practice.